Well, it's about that time of year again. Mardi Gras? Valentine's? Nope, it's time to renew my Sirius contract. I've loved having it over the past year. It's made roadtrips that much more enjoyable. Any news I would otherwise miss I can get on CNN, Fox, NPR, Bloomberg and the list continues. As for music, which was the reason I got it, almost always has something fresh that I want to listen to. No more scrolling through pre-made selections of mp3s for me. In fact, I don't even think I've used my CD player more than a few times over the past year. I love my Sirius so much I decided to go for a lifetime account. The website claims $499.99 but it's currently $399.99. The payments are spread out over a few months. They take into account any time left on your current plan (I should've done it sooner!) and knock that off your first bill. The lifetime account carries over to the merging of XM and Sirius, whenever that happens, and I'll only see more content on my channel selection, no additional payments required. I'm excited and you should be too. I got the coolest Valentine's gift today (from my Valentine). Jennifer bought me the SIR-JVC1 Sirius satellite radio tuner for my car stereo. Back when I got my stereo, I found out there were several adapters I can get. You can choose from the standard CD changer, an iPod dock(KSPD100), Auxilary input (Car PC? ), an XM tuner or a Sirius tuner (SIR-JVC1). Notorious has had Sirius for a while now, and I've always enjoyed listening to it when I'm in his truck. Coupled with the fact that the local broadcast stations either play ghetto rap, Top40 and/or Nickelback; I was growing tired of the radio. I wasn't really exposed to new music very often, so my music collection was going stale. To top things off, sometimes the stations out of Shreveport aren't very strong and I can barely hear them. I had told Jenn I wanted Sirius, and at the store the other night I pointed out the adapter I would need for my car. I installed the system over the course of this afternoon, interspersed with my classes, and activated it around lunchtime with a one-year subscription. I mounted it under the passenger seat and routed the cables under the carpet so it's out-of-sight/out-of-mind. Needless to say the music selection is awesome, and, like you always hear, the sound quality is amazing for being a radio signal. That's all for now, going for a drive! The particular model I was looking at was the VRCD400SDU from the same people that made the FM modulator I got for Christmas. The FM modulator is pretty neat, but it is lacking in some areas. It resets your song back to the beginning whenever power is lost. It plays the songs in reverse alphabetical order, and you only get FM quality sound (not the full range of the music). I needed something more, and the VR3 stereo at Walmart seemed alot nicer than the modulator. The stereo with built in USB port would fast forward through MP3s, let you browse by folder and other options. I stopped by Best Buy one afternoon to see if they had anything comprable to the novel idea of having a USB port on the stereo - and they did! They had a couple of generic stereos with USB ports that looked/sounded better than the VR3, and 2 JVC models. One thing I didn't care for on the VR3 was the display, it would only dislpay about 8 characters at a time, then the next 8, then the next. It didn't smoothly scroll the text, not to mention that it was using the alphanumeric segmented display. After seeing the dotmatrix LCD, I realized the JVC KD-G820 was the one for me. It has a beautiful display, smooth scrolling, MP3/WMA playback, sounds 100x better, more sound control, front USB port, rotary dial, ability to connect to either XM or Sirius satellite radio or hook up an iPod interface. I purchased the stereo, and installed it last night. Well, I'm a late bloomer I guess. About two weeks ago I finally tuned into Last.FM, one of those "if you like _____ band, check out ______" type of sites. They recommend (and stream) music from other musicians based on your preferences. Sounds familiar? 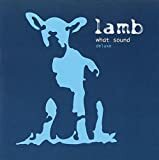 I finally listened to the Lamb album "What Sound? ", an album that I heard tracks from years ago, but didn't have a taste for the music. I rediscovered it after downloading it from RCA's MP3 site. I'd say it's trip-hop, chill-out with some experimental sounds thrown in - very ecclectic. It's nice to listen to at night, when you're just wanting to relax, but not quite ready for bed. Check it out when you get a chance, or purchase it here. Ok, this is my first post. I am reviewing a newly released electronic album I have purchased. If you don't like electronic dance music (EDM), please do not waste space posting comments or I'll have to smack you. Those who are biased against it might think it all sounds the same... right? Wrong, it's a lot more diverse than the mainstream, I'll tell you that; all of the crap that has been forced down our thoats by MTV, Clear Channel, top 40 radio stations and so on. As we watch people en masse follow the stupid trends that the idiots in these bands and so-called "musical icons" portray, it is refreshing to sit back and listen to a few albums that are rockin' from start to finish. That's how its supposed to be. Yeah, albums of this caliber are the equivalent of listening to Pumpkins' Siamese Dream all the way through. You get that tingly feeling all over when the last track is over. But enough of my ranting, lets get to the music. The album I am reviewing is not a well known production. Kyau Vs. Albert from Germany. The album Here We Are Now is excellent from start to finish. The first disc is their production album. This isn't just another DJ mix. Every track here is their own and they are superbly mixed as well. This has it all. Emotional breakdowns, slammin beats, groovin basslines, fantastic vocals. A few guest vocalist are featured. CD2 is a mix compilation of some of their remixes and other artists as well. This is an excellent duo that can only be compared with that of Gabriel and Dresden, Paul Van Dyk, and Sasha.. but with the Kyou vs. Albert twist and a their own defined style, shattering the rules of trance and defying the laws of breakbeat. Here We Are Now is a terrific Progressive album. I picked up a copy of the Gabriel + Dresdent - Bloom CD today. Its a great album. I've always been a fan of every remix this duo puts out. I especially like their spacey, progressive remix of Groove Armada - Superstylin'. Definately one of my favorite remixes of an already good song. Last September or so, they released a mix CD. On the CD are some of their newest remixes as well as unreleased single tracks they produced. Very good stuff, and you can definately tell it's them, it has all the markings of G+D style. If you want some great chillin music, get it. If you want some great driving music, get it. If you want some slamming beats, get it. It's all on there. I guess I never thought of looking for an MP3 stream recorder, maybe I never wanted to record a stream bad enough. The whole idea was news to me. It's a simple concept, and they have existed for quite some time now. But for what it's worth, here is the MP3 Stream Recorder that I've been using lately. Ishkur's Guide to Electronic Music has been remade. It is a great sampler of all the many, many genres of electronic music that are out there. You'll like some, hate others, and laugh at the rest. The new update now includes several clips of each type of music (instead of just one clip like previous versions had). It should give you a decent taste of each of the types of electronica out there. Tommy, you mean its not all called "techno"??? *gasp* No, although most people call it "techno", Techno is but just one class of electronic music. So check out what all is out there. By the way, props to Ishkur for adding the seperate Downtempo section - I'm ALL about that stuff. And the time-maps, lets you know when things came out and what/when they evolved from. I'm fired up. REM is on tour for the Greatest Hits record that should be out soon. Its got all their hits, "End of the World", "What's the Frequency, Kenneth? ", "Everybody Hurts", and some of their lesser known hits "Find the River", "Begin the Begin", "Fall On Me". update : The show was awesome! Everything was great. They should post the setlist to their website. Ed Harcourt sounded quite a bit like Coldplay, with maybe some Radiohead thrown in for 'artistic genius'. REM came out kickin' with "Begin the Begin". Also got to hear a few new songs, as well as their biggest hits (save for a few from Monster). They ended with a great little tune called "End of the World...". , and was probably the best way to end an REM show. I loved it. For more information, visit REM's site at www.REMHQ.com. Proton Radio plays some awesome music. Very deep progressive beats. DeepMix.ru is another great online stream : just a little more down-beat and relaxing. For you junglists and DnB heads, check out JungleTrain and BassDrive. If you want to go completely relaxed, check out FlareSound, they get funky and downbeat. Check 'em out! Enjoy! Page generated for 54.235.4.196 in 0.05506 seconds.